Obedience Misadventures My trips into the obedience ring have frequently been fraught with misadventures and mishaps. Probably one reason for my embarrassing experiences is that I have never possessed the intense competitive drive necessary to be among the upper echelons of obedience competitors although one of my dogs did actually go high-in-trial once but that was purely an accident. Obedience Training Philosophies: What Kind Is Best for Your Dog? 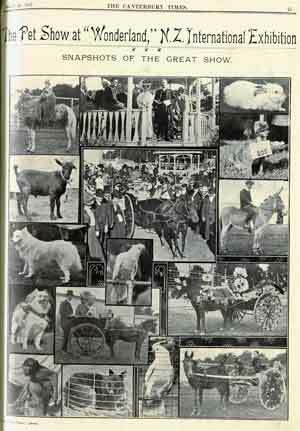 Caption: The pet show at "Wonderland", New Zealand International Exhibition. Snapshots of the great show. Source: Canterbury Times, 20 Mar. 1907, p45. People are attracted to agility for a wide variety of reasons. Some simply want to spend some "quality time" with their dogs, doing something that's fun. The only thing that's more fun than watching dogs do agility, is doing it with your own dog! Internationally accomplished handler, known for her running contacts. Web site has some videos worth watching if you have broadband. 1. Always keep your eye on your dog. How can you react instantly if you have your back to your dog? 2. Use the arm and the leg nearest to your dog to direct it. This will not only be far clearer for the dog to see but also far easier and quicker for the handler to run without twisting his or her body. 3. Face the way the dog is going until it is fully committed to an obstacle. First, this will keep your dog powering forward to each obstacle due to the clear body signal but will also prevent many faults (classically, poles down and refusals), Commitment of your dog to an obstacle will mean that whatever you do, the dog will take the piece of equipment successfully. This will vary from dog to dog and can also change as the dog progresses through training. A Light Weight Dog Walk - made of gutter pipe! Free Agility Dog Walks And Dog Teeter Building Plans The dog walk is a very daunting obstacle in an agility course, it's also the most expensive to purchase. Why are Jumping Drills So Important? How to turn your pet into a superstar athlete. Admit it, your kids stink at sports. But just because Casey can't hit a T-ball and Brandon can't putt through a windmill doesn't mean your dream of becoming an overbearing sports parent has to die. Simply shift your attention from that ungainly preteen and focus on the squirrel-chasing collie in your backyard. Watch Frisbee in action on You Tube -- amazing action really. This guy has been in the press because of his dog's ability. My dog isn't interested in catching the frisbee? What now? Teach Your Dogs to Pull- Running dogs and training dogs are two totally different things. Too often in the enthusiasm and frenzy of the moment we let our dogs run all out at the beginning of a run. Bikejoring Skijoring with a bicycle instead of skis. "The Sled Dogs: Keeping Athletes at the Top of Their Game"
"Dancing with the Dominant Dog: How to Build a Better Relationship"
Freestyle doggy dancing The Top Lodge Trio is a group of three of the top handlers in Europe. Kath, Karen & Lesley have all taken 1st place at Crufts and won more Advanced Classes in competition than any other group. Getting Started with Freestyle Obedience training is essential to Freestyle, as obedience provides the foundation for developing the dog's athletic and training potential.